I have produced a map of the location of a broad selection of low impact communities in Britain. This is useful to help us see the sheer variety and growth of these communities, and also to understand how they are clustering in certain places. These are all actually existing projects which have been completed except for LILAC (Leeds), which is in the process of being built. These then include rural and urban projects, despite urban projects often having less space from which to generate energy or alternative incomes. Overall such communities are concerned with much more than just the architecture, instead it is about the way people live, and live together, which is significantly more important. In terms of how these communities compare to eco-housing per se, the novelty is the way in which they bring all these different aspects together in one place. 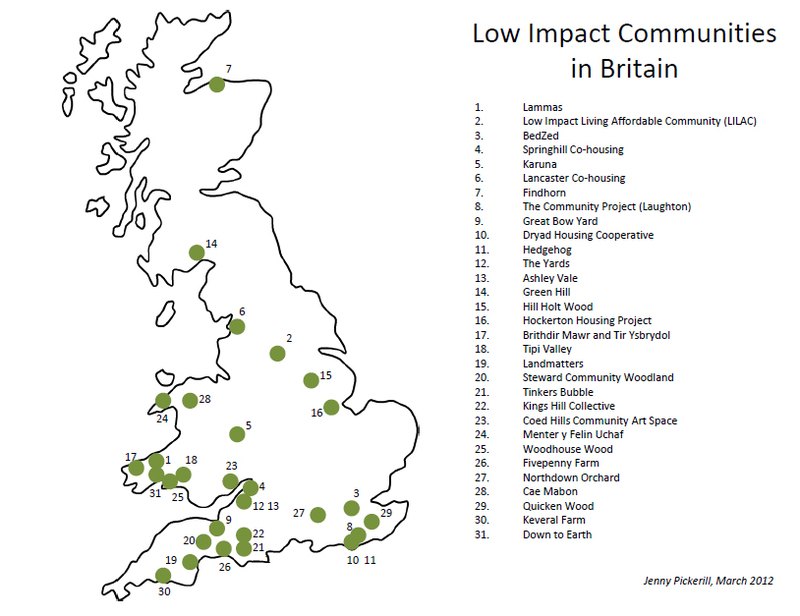 The map is also available as a PDF here: Low Impact Communities map. Please feel free to use it, but please acknowledge its source. I would welcome any comments, correction or additions.